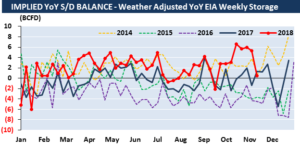 On November 21, EIA announced the first withdrawal for this winter season, a massive -134 BCF net withdrawal for gas week ending 11/15. This brought a massive drop in gas inventories, pushing gas stocks down to 3,113 BCF, 710 BCF lower than the 5-year average. 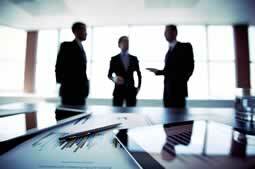 This withdrawal was also much higher than market expectations, which averaged just 114 BCF. Since 1994, the storage draw for this same gas week averaged just 20 BCF, with a previous record-high pull of 90 BCF in 2000. 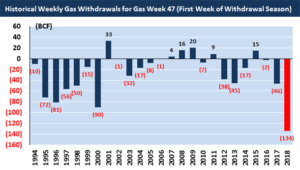 This week’s 134 BCF withdrawal will mark the maximum pull for the same gas week since at least 1994 (EIA’s earliest available weekly storage data). From a regional perspective, tighter balances in the Midwest and South Central regions were major contributors to this week’s larger-than-expected withdrawal. In the Midwest, surging heating demand, strong power burn as well as higher gas exports into East Canada offset increases in gas flow along the Rover and NEXUS pipelines. In the South Central region, potential production freeze-offs and strong export demand (Mexico + LNG) tightened this week’s supply-demand balance. Adjusted for weather, this draw also measured the tightest week since late September. Week-over-week, this withdrawal runs nearly 5 BCFD tighter on a weather-adjusted basis, which is significantly tighter than our observation based on pipeline storage samples.